PF minister of Justice Ngosa Simbyakula on Thursday presented the Constitution of Zambia amendment bill to Parliament. 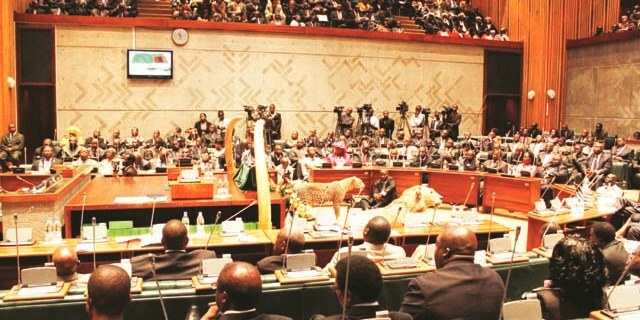 The bill is aimed at amending the current Constitution of Zambia. Among the major changes the new constitution will have is that the Vice President of Zambia will be elected together with the president under the so-called ‘running mate’ clause. For a person to win the presidency he or she would be required to obtain more than 50 per cent of valid votes cast. In addition to elected MPs, the new constitution will also provide for 94 MPS who will not be directly elected by Zambians but ‘suggested’ by political parties but chosen by the Electoral Commission of Zambia. ‘ (3) The number of seats to be allocated to a political party, for purposes of clause (2) (b), shall be calculated by multiplying the figure one hundred by the percentage of the total aggregate vote, obtained by a political party in the National Assembly elections, using the largest remainder formula, as prescribed.,’ reads the suggested amendments to the constitution. What this means is that, after the general elections, the ECZ will ask all political parties who would have won some parliamentary seats to send a list of individuals to be considered for nomination as MPs. From these lists, the ECZ will chose 94 people and make them MPs. The party that would have won more seats during elections will also be given the biggest number of bonus MPs. The most important point here is that the ECZ will have discretion to decide who to make MP. And since the ECZ is a government institution, the winning party will there decide who the 94 bonus MPs will be. The new constitution will also make dual citizenship legal but individuals will dual citizenship shall not qualify to stand for election as president of Zambia.